With the much leaked OM-D E-M5 camera finally on the marketplace, Olympus now has two highly specced Micro Four Thirds cameras in its offering. The Olympus PEN E-P3 was only announced in June 2011, and is currently on sale for around £450-£500 less than the anticipated RRP of the OM-D. So, is the OM-D worth the extra investment? If you're already an existing PEN user are you better of sticking with your current camera or is it time to jack it in and get the new model? Here we take a look at some of the headline specs of the new camera to see how it stacks up against the E-P3. Although both cameras feature a Micro Four Thirds sensor, the OM-D boasts a 16.1 million pixel sensor, compared with the E-P3's 12.3 million pixel offering. Olympus claims that noise reduction on this camera is significantly better than on existing PEN models, so it will be interesting to see how well the camera copes with low-light shooting conditions, especially with those extra pixels to play with. Both the OM-D and the E-P3 use the same processor, the TruePic VI. 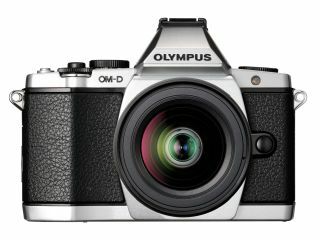 However Olympus does claim that it has been refined and enhanced for the OM-D, presumably to produce those low-noise images and to provide the increased shooting speed. For photographers who like to use a viewfinder, the OM-D is likely to appeal straightaway because it has one built in, unlike the E-P3 which requires the purchase of an additional accessory. The OM-D's finder is a 1.44 million dot EVF, which offers 100% frame coverage and also gives the option to make key changes to major settings. Of course the original idea of compact system cameras such as the OM-D is that you get DSLR style image quality in a much smaller body. As time has gone on and this type of camera has evolved, some manufacturers have gone the way of producing cameras that are almost DSLR sized, such as the recent Pentax K-01 for instance. Here, we have a magnesium alloy body for the Olympus OM-D E-M5, which has been styled in a retro, or "classic" way, and is ruggedised. The E-P3 on the other hand is constructed from metal and plastic, and while it does also have a retro look to it, it's not really any match for the new camera. So, it's a question here of style over size. If you want the full retro experience, the E-M5 wins out, while for ease of portability, the E-P3 takes the crown. Both the PEN and OM-D claim world-leading quick autofocus, courtesy of the Olympus FAST (Frequency Acceleration Sensor Technology) system. At the time of the PEN's launch, it was claimed to be the quickest in the world (for CSC cameras). The same FAST AF system is used in the OM-D, but it's said to have been enhanced for even quicker operation. It is now so rapid that Olympus claims that it is now faster than all other autofocus systems, including those in DSLRs. This is something we'll be extremely keen to test out once we get our hands on one during a full review. The E-P3 has the capability to record images up to ISO 6400, but its low-light performance isn't particularly impressive. On the OM-D however, the sensitivity has been boosted up to 25,600. Time will tell if the extra sensitivity will actually be of any use, but Olympus does claim that noise levels are 75% lower than on the PEN series. The E-P3's OLED screen is one of the slickest we've used in recent months, probably down to the fact that it uses a capacitive type touchscreen (the same as used by the iPhone). It's quick and responsive and easy to use. Sticking with touchscreens, the OM-D goes even further by providing a tilting screen, which will prove handy for composing from awkward angles and is also likely to be appreciated by those shooting video. Though it's a shame it's not fully articulated, it's nice to have some flexibility all the same. The new 5-axis image stabilisation is one of the key features that Olympus is keen to push with the OM-D. It allows for blur to be combated by tackling five different kinds of motion, which the company says is especially useful when shooting macro subjects. By comparison, the E-P3 can only combat for two different types of motion blur, along the vertical and horizontal axis. This means that the OM-D has the potential for sharper and clearer images at lower shutter speeds, and again is something we'll be extremely keen to test out when we get a full sample in to review. Both the cameras feature the ability to shoot video in Full HD 1080p, however the tweaked processor should mean that operation is smoother. A new creative function, Live Echo, is available on the OM-D, but this is potentially something that could be added to the E-P3 (and other PEN models) via a firmware upgrade. Olympus is well known for including art filters on its cameras, with the E-P3 boasting an impressive ten, including Cross Process and Pinhole effect. Some of these can be mixed together for extra creative effects, but this is something that has been expanded on the OM-D.
Another filter has been added to the OM-D, the Key Line filter, but again, this is something that could potentially be added via a firmware upgrade to older models. At £1149.99 (including kit lens), the Olympus OM-D E-M5 is one of the more expensive compact system cameras on the market, but it does offer some seriously impressive specifications. Although the E-P3 is still a fantastic camera for the price, for the extra £500 you do get some significant upgrades with the OM-D, including an EVF, tilting screen, more megapixels, greater sensitivity and the promise of reduced noise. It's also worth remembering that £1149 is the recommended retail price, which will likely be cheaper once the OM-D E-M5 actually hits the shops, making that price difference even smaller. We're not sure if we'd go far as to recommend existing E-P3 users ditch their camera in favour of the new OM-D, but we can certainly see that they would be tempted. For those sitting on the fence between the two, it will likely be a difficult decision and may ultimately come down the intended use for the camera. Street photographers who are mostly working in daylight will probably do better to stick with the smaller form factor of the E-P3, as will many casual or holiday users. However, for those looking for a more serious back-up camera to a DSLR for instance, the E-M5 looks like it will be an impressive package, squaring up against the likes of the recently announced Fujifilm X Pro1, and the Panasonic GX1. Look out for a full review of the OM-D in due course, and in the meantime, check out our Hands on: Olympus OM-D E-M5 hands on review.